Jorge Lorenzo finally won a race on his Ducati earlier today at Mugello – a year and a half since his last victory aboard a Yamaha. From the second spot on the grid, Lorenzo led into the first corner and was never headed as he cleared off to a sizable lead before the checkered flag. This looked like the Lorenzo of old, who seemed to dominate, and win, races in this manner countless times aboard a Yamaha. His teammate Andrea Dovizioso finished second, and Valentino Rossi (Yamaha) joined them on the podium at his home race. Early on, riding near the front, points leader Marc Marquez (Honda) low-sided into the gravel. Marquez re-joined the race, but finished outside the points in 16th position. Despite this, Marquez still holds a 23 point lead over Rossi. Follow this link to full race results. For additional details and points, visit the official MotoGP site. Lorenzo goes to Honda for 2 years as MM Teammate…..
Yep, I expected Pedrosa to lose the seat, but Lorenzo to Repsol Honda surprised me. But then, he never shrunk away from taking on the number one rider on the same bike. What if…. JL cannot make the Honda works…? I would die to know how much he signed for vs MM or his position on Ducati. That’s the big question, isn’t it? He’s spent his career with Yamaha building him a bike that works for his “round turn” style, while Honda has spent that time building a “J-turn” bike, for riders who stop-turn-go. Honda does supply bikes to several teams with all kinds of different riders, so maybe it’s more adaptable than we realize? There’s no way he’ll earn anywhere close to what Ducati paid him ever again. Unless he wins multiple races in a row and pulls down another championship, that’s over. Holy crap! Dani FINALLY lost his factory Honda ride! HOLY CRAP! Lorenzo signed with Repsol Honda to replace Dani as #93’s teammate! Have to admit, I was dead wrong there. Never thought #99 would agree to be #93’s wingman, but there it is. He did it. I assume he plans on winning, too, and challenging Marc for titles. Major respect to Jorge for this. Serious balls. I dunno….Lorenzo seemed to be MM wingman more than Rossi’s wingman when he was with Yamaha…. It’s too quick to decide on JL future based on a one race performance, his only single winning so far on the DUC. But it could happen that the fuel tank (A.K.A. 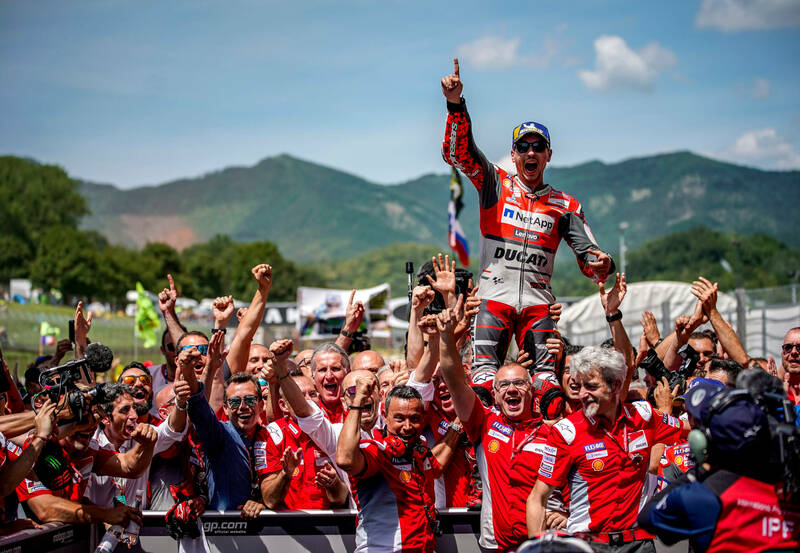 you either start winning or good luck signing another big check when Dovi proves the bike is competitive) it’s the actual reason. Good ol NG would say it’s the spaniard conundrum conspiracy…. He’s already said he’s leaving Ducati. Maverick Vinales complaining bout the Yami. There is going to be an interesting re-configuration for next year. Hopefully the Suz will have a brighter spot. I think Ianonne has kept Suzuki in a pretty bright spot this year. I believe letting him go is probably a mistake. What means “tried?” We saw MM low side, apparently correlating to his hard rear tire choice. PS – wow, in trying to edit… I reported my own comment. Again. You one upped Rossi – winning on the bike he couldn’t – on an Italian bike no less – Congrats! Looked like the JL of old…. He won on a bike that is nothing like the one that Rossi (or anyone else) couldn’t win on. I’m happy for Ducati, but this bike has nothing in common with that of the Rossi’s era. VR didn’t won, but was the best Ducati pilot the two years he was painted red. Indeed, and with Dovi’s wins and several other top finishes, there can be no doubt that the Ducati is as capable as the Honda or Yamaha. The Duc seems like the bike to beat on faster tracks, but Honda and others seem to have them covered on tighter, more technical circuits. Lorenzo’s insistence on running soft front tires is a dead giveaway that he doesn’t get good feedback from the front end. This is exciting, JL gets his new tank and WINS!! We’re only a third of the way through the season so it will be interesting to see if he and his magic tank continue to perform at the levels he’s capable of. If he does….what a conundrum for Ducati. JL effectively won at Malaysia last season and gave the race over to Dovi. That is conveniently forgotten by most of his detractors. He has been interesting to listen to since he started at Ducati, talking about the changes that both he and Ducati had to make. JL has always been an insular character, and I downright detested him in his 250cc days. But he went into the Yamaha seat not to be a wingman and won 3 titles. That deserves alot more respect than he gets. He has shown pace at Ducati regularly, but tyre longevity has been his downfall, as well as a failure to get tough when dicing with others. I was reminded yesterday of how dull many of his wins were in the past, but it was a monkey off his back and that was great to see. The desire to have a different teammate for Dovi seems like change-for-changes-sake to me. I don’t think the results from Petrucci or Miller will be better, and the Ducati stable is in good condition right now. Lorenzo’s arrogance has traditionally made it hard for me to root for him, but I have to admit I have been hoping each race weekend that he would finally get the formula right. I was very happy to see him on the top step. 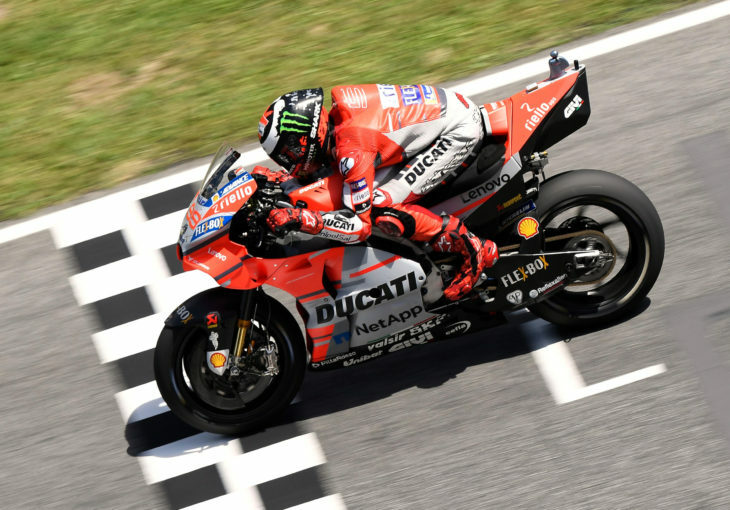 He has said before that the main issue with the Ducati this year was the physicality involved due to the ergonomics, an excuse that I dismissed as nothing more than a deflection of poor performance. Looks like he may have proved me wrong. A few more wins and podiums this year would confirm that. I don’t know what’s more breathtaking: That they were 210-215mph down the straight, or that these cruise missiles have brakes that will haul them down from those speeds to less than a 100mph just like that. This was JL as his former self, and I think MM’s desperation to get to the front on the first few laps was testament to just how strong the Ducks were: Jorge put six seconds on the field, just amazing. Fun to see his sour-pussed self so happy, and it had to be satisfying that he won on a Duck (which the Doctor never could) at Valentino’s home race. Good to see Jorge win. Too bad Marquez crashed out though. I think that there would have been an epic battle between those two. That’s the worst thing about this race, missing the JL/MM contest. On the one hand MM is the best living pavement scratcher overall. OTOH, considering JL’s 6S margin over #2 Dovi, I suspect JL may still have beat even MM yesterday. On a related matter, MM only passed one or two back markers after his spill. OTOH, his bike may have been slowed by crash damage (I saw no physical evidence of damage), and/or he may have seen the writing on the wall, that he would get no points, so he just cruised to finish the race. FWIW, Marc indicated that he could not have caught/beat Jorge regardless of the fall. OTOH, if you look at his post-remount race pace, it was pretty good. I’m tossing out the last 3 laps, because Marc backed out of it (“cruised to the finish”?) with 3 laps to go. I don’t know if he just relaxed, or if he was having a problem and couldn’t go any faster. At the end of lap 5, Marc was 23.484 seconds behind Rossi. At the end of lap 20, he was 24.719 seconds behind. Ie, he old was off “podium pace” by 1.235 seconds over 15 laps. Compared to Morbidelli, the 15th place finisher, he was 15.727 seconds down on lap 5, and 9.892 seconds down on lap 20. Ie, he gained 5.835 seconds over 15 laps. None of that changes the results, but it is an indication that Marc would have possibly competed for the podium without the crash, but it’s highly unlikely that he could have challenged Jorge for the win. I was very disappointed with the BT announcers, and would have liked to see more camera time for Jorge. Some of us like to watch the great lines of the great riders when they are at the top of their game. It’s not all about watching the also-rans fighting over scraps. I enjoy both sides of the sport. Thank you, very enlightening. Double your last paragraph. The speed at extreme lean angles is almost supernatural. I gotta admit the video quality and camera angles is generally phenomenal, especially the camera on the rear body panel behind the seat. That’s very encouraging to the health of the class, when the world’s fastest rider is only taking .3-4sec/lap from the rider in 15th place. It was great to see the old Jorge on the track, and a mellower Jorge on the podium. IMHO, it looks like Ducati signed Dovi too early for too much money, and waited too long to listen to Lorenzo. While I’d prefer to see Lorenzo stay with Ducati for another season or two, from his comments it looks like it is probably too late for that to happen. It’s too much to imagine than Jorge can recover the 54 points of Marc’s lead, but it’s not a big stretch to think he could come in 2nd in the championship if Ducati keeps/starts supporting him with a good bike. If he winds up signing with another team, who knows if Ducati wants to win badly enough to give him a good bike through the end of the year? Sounds like this victory could have happened some time ago if not for the (perpetual) arrogance of Ducati engineers. Lorenzo alluded to this fact in comments after the race. When he voiced his concerns, particularly about the fuel tank issues they told him it was in his head. This follows the same “the bike is perfect, it’s you” attitude that Rossi, Crutchlow, mechanics and others have pointed out about Ducati shortcomings. A culture of sensitivity and outright dismissal to criticism about the bike. I’m guessing a few lucky bettors came out very nicely this weekend. Where is that – over in Spain?